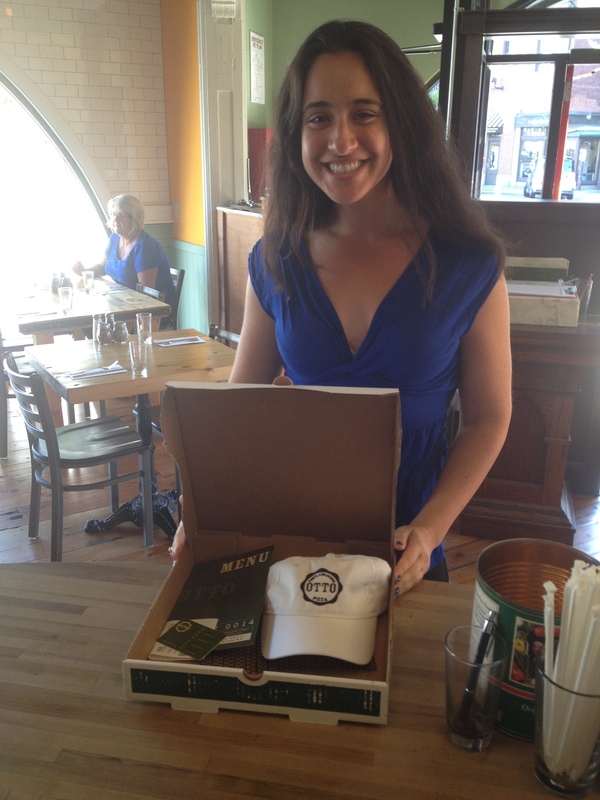 Gillian Hurwitz, who is helping to organize a mini-golf tournament to benefit the Jimmy Fund, stops by the OTTO Pizza shop in Brookline, MA, to pick up a contribution to the event: a $100 gift card and an OTTO Pizza hat – prizes you can win if you attend the event tonight at the Dana Farber Cancer Institute in Boston. If you’re looking for something to do tonight in the Boston, might we suggest you drop by Longwood area and take part in the Dana Farber Cancer Institute’s Mini-Golf Tournament to benefit the Jimmy Fund? There’s a $20 admission, and all the money goes directly to the Jimmy Fund, which supports pediatric cancer research and treatment. You couldn’t think of a more worthy cause. Beyond the obvious mini-golf action, you can win fabulous prizes, donated by area restaurants and merchants. OTTO Pizza’s kicked in a $100 gift card and an OTTO Pizza hat. Georgetown Cupcake, JP Licks, Boston Boxing, The Liberty Hotel, Paris Creperie, The Isabella Gardner Museum, Life Alive and Flour Bakery have also contributed merchandise that will be given away in a raffle. Here’s the deal: the event starts at 6:30 p.m. at the Dana Farber Institute, located at 420 Brookline Ave. in Boston’s Longwood district. This entry was posted in Coolidge Corner and tagged Boston, Boston University, Brookline, cambridge, Comm Ave., Commonwealth Ave., Coolidge Corner, Dana Farber Cancer Institute, delivery, Fenway, gift card, harvard square, Jimmy Fund, Longwood, massachusetts, mini-golf, miniature golf, Pizza, pizza delivery by elshepherd. Bookmark the permalink.